Pen-and-ink drawing of details of the Queen's mosque at Ahmadabad, Gujarat, by an anonymous draughtsman between 1884 and 1886. This image is from the Burgess collection, an album of 49 drawings of plans, sections, elevations, sculpture and architectural details of Muslim monuments in Ahmadabad and the surrounding areas made between 1884 and 1886. The drawings were prepared mainly by Indian draftsmen under the supervision of James Burgess (1832-1916). The city of Ahmadabad was founded in 1411 by Ahmad Shah, the Sultan of Gujarat, on the site of the village of Asaval on the banks of the Sabarmati river. The Ahmad Shahi dynasty ruled until 1537 reaching its zenith under Mahmud I, popularly known as Mahmud Begarha. The Queen’s Mosque and Tomb, located near the Sarangpur Gate, were constructed by Malik Quivam ul Mulk Sarang, a nobleman at the court of Mahmud Begarha. He was a Rajput who converted to Islam and became governor of the city in 1521. The mosque has five large domes above a series of arched gateways the central one being the larger and higher than those to each side. The two elaborate minars are truncated at roof level and resemble those of the earlier Bibi-ki-Masjid. 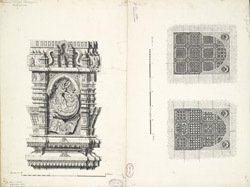 This image shows two perforated stone windows or 'jalis' and an exterior niche containing a carved foliate motif. The influence of temple architecture was strong in the sultanate buildings of this time in Gujarat and included the adoption of local stone-carving techniques to decorate Muslim monuments.